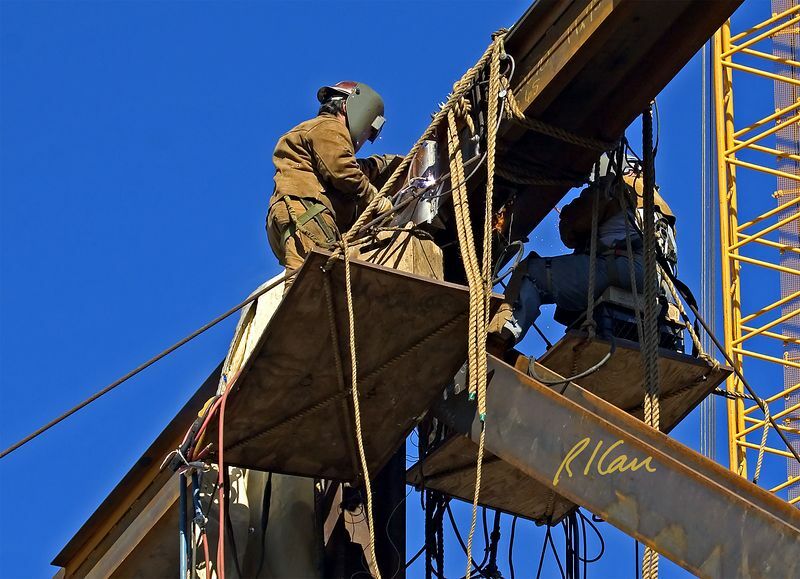 Steel construction: Two leather clad structural ironworkers perform torch work on massive steel connection of large steel truss. Each is working off of a rope supported plywood temporary work platform about 50 ft in the air. Each ironworker has fall protection from body harness, safety lanyard, and tie off to top chord of steel truss independent of the work platform. Ironworkers working at height on a small temporary platform in the dark behind welding masks are in an extremely vulnerable situation that requires secure fall protection. UCLA, Los Angeles, CA, 2004.